The magnetic “north pole” is moving 40 miles-per-year toward Russia, signaling the beginning of a total pole reversal, scientists warn. The magnetic north pole is currently shifting at the fastest rate in human history. Scientists say it might be a sign that Earth’s poles are about to swap places. 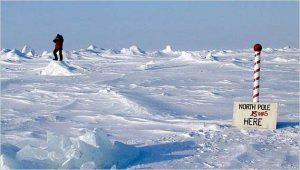 “Throughout most of recorded history, the pole has been positioned at or around Canada’s icy Ellesmere Island, but if it keeps moving at its current rate, it won’t be long before it sits above Russia instead,” MNN reports. Unlike true north — which is marked by the Earth’s axis — magnetic north is constantly on the move due to changes in the planet’s molten iron core. But in 1989, it sped up to an accelerated rate of almost 40 miles per year. “It didn’t move much between 1900 and 1980 but it’s really accelerated in the past 40 years,” Ciaran Beggan, of the British Geological Survey in Edinburgh, told Reuters. The shift is causing major problems for aviation, navigation and migratory animals that use the Earth’s magnetic field to orient themselves. A five-year update of the World Magnetic Model was due in 2020, but the U.S. military requested an unprecedented early review. In the last decade alone, the drift has increased by 33%, throwing off compasses by roughly 1 degree every five years. The rapid changes are already causing major headaches for the U.S. Federal Aviation Administration. Some airports are even starting to change the names of their runways, which correspond to degrees on on a compass. The shifting pole may also become a grave concern for migratory wildlife, such as birds, turtles and other sea creatures. It’s unclear if these animals are capable of recalibrating their navigational instincts. The moving pole isn’t supposed to affect smartphones or GPS devices anytime soon. “It doesn’t really affect mid or low latitudes,” Beggan said. But some experts believe we’re witnessing the beginning of a complete pole reversal, which we are overdue for. Typically, Earth’s magnetic poles “flip” — whereby all compasses invert and point south instead of north — every 300,000 years or so. But it’s been 780,000 years since the last flip. Scientists disagree on how a pole reversal would effect ecosystems around the world. Some predict catastrophic earthquakes and tsunamis will wreak havoc for decades. “Reversals take a few thousand years to complete, and during that time the magnetic field does not vanish. It just gets more complicated. Magnetic lines of force near Earth’s surface become twisted and tangled, and magnetic poles pop up in unaccustomed places. A south magnetic pole might emerge over Africa, for instance, or a north pole over Tahiti. Weird. But it’s still a planetary magnetic field, and it still protects us from space radiation and solar storms. Supercomputer models of Earth’s magnetic field. On the left is a normal dipolar magnetic field, typical of the long years between polarity reversals. On the right is the sort of complicated magnetic field Earth has during the upheaval of a reversal.